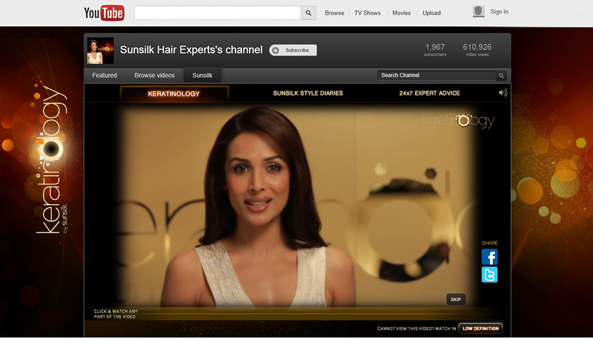 Sunsilk has revamped its Hair Experts Youtube Channel and how! The new zone has been created to promote its Keratinology range of products that has been specially designed for salon treated hair. 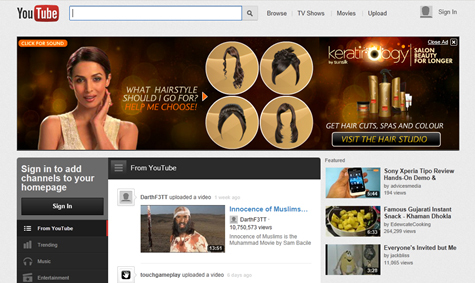 The Virtual Hair Studio application on Youtube creates a salon-like environment with a rich video interface. A range of professionally created videos have been shot with Malaika Arora Khan and a model to bring together the brand story on Youtube. The experience starts with an intro video that leads to the Keratinology Kiosk. Users need to enter their name (optional) and identify their hair type and salon treatment they’ve undergone, which helps in personalising the interactions and videos the application suggests. I loved the attention to detail, for example how the app simulates an appointment for the exact time that you are at the Kiosk. You can choose to get into the virtual styling booth where you need to upload a picture or take one using a webcam. The application gives you hair style options to choose from and allows you to download and save the looks you like. The platform has a host of videos demoing various salon services using Keratinology products. This is an excellent execution and one that’s been built with a lot of pre-work and you can see that. Labels: CPG, Hair Care, Keratinology, Sunsilk, Sunsilk Hair Experts Studio, Youtube Brand Channel, Youtube.